Good morning! Today we will report live from the genral strike against the repression by the Spanish Guardia Civil and Police Nacional on October 1. You can read the call for the general strike; here. You can send your pictures, videos, reports and analysis to enough14@gmx.net. Click at the refresh button of your browser to get the latest information. You will find the updates at the bottom of the page. 10.00am Last night there were protests against the Guardia Civil and the Spanish Police Nacional in several cities and towns. After the police violence in the night from October 1 on October 2 the protests were more intense in Calella. As a consequence dozens of cops were kicked out of two hotels by the hotel management after their agression the night before. The Travé Hotel in Figueres announced that they will not renew the reservations for Spanish security forces and force them to leave the hotel. Image: Annoucement from the Travé Hotel in Figueres. 10:33am The AP7 highway is blocked on three points in the counties of Girona and Penedes, as well as the AP2 in Molins de Rei, the C32 at the height of Sitges and the C25 in Vic. In total, 15 major routes are blocked due to the general strike. Access to the French State and Andorra are also blocked. In Barcelona ​​there are several blockades, like for instance at Lesseps Square. 11:30am Image of general strike protests at Plaça de la Creu Alta in Sabadell. Image by Twitter account @sapoconcho. Calderdale SF/IWA condemns the police violence against Catalan citizens on the 1st October 2017 who went to vote on what the Spanish state has declared to be an illegal referendum on independence. While, as anarchosyndicalists, we don’t support the creation of a new state, which reflects mainly the interests of the Catalan bourgeoisie, we do condemn all police violence and intimidation against men, women and children. Instead of the creation of new states with warring police and capitalist factions pitted against one another, we favour the deeply embedded solution of libertarian federalism – free, self-managed communities that are plural, open and tolerant. 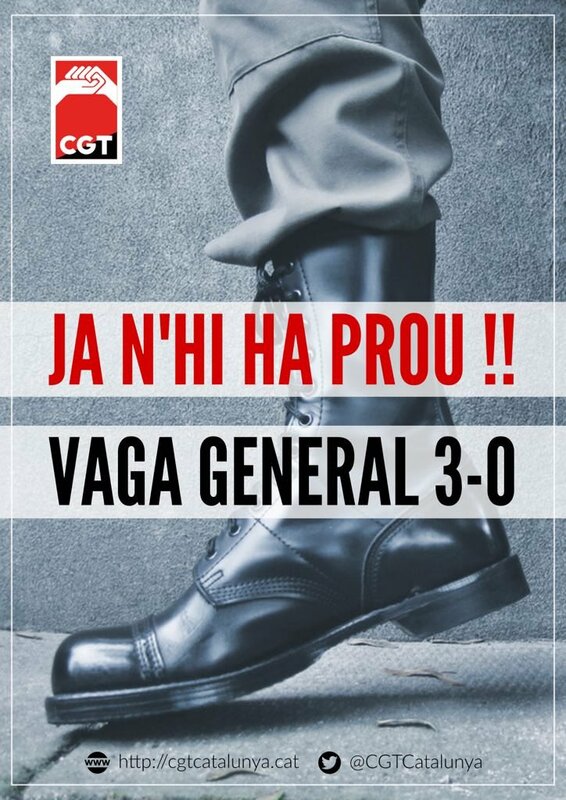 Calderdale SF also supports the general strike called in Catalonia by independent unions such as our sister union the CNT on 3rd October, which not only opposes a capitalist free-for-all as proposed by all state actors but which also defends the self-empowerment of the working class. 03:29pm Video from a bit earlier. Fire fighters protesting at Spanish Policia Nacional HQ in Barcelona. #VagaGeneral30 Spanish police and guardia civil comming out dressed in civilian clothes from Piolin boat in Barcelona!! Be careful!! 04:10pm According to several tweets the people on the image below came from the boats where Spanish cops and the paramilitary Guardia Civil are stationed in the port of Barcelona. Be careful for provocations by plain clothes cops and Guardia Civil! Note: We don’t have confirmation. But Spanish CNT Dockwerker Union the image below is not a fake, but its from this morning and no related to any provocations. 04:49pm 50 roads blocked in Catalonia. 05:30pm CNT dock workers union confirms that the image of the plain clothes cops is real BUT its from this morning and not related to provocations. They also came back to the ship. 06:38pm An update with a few more cities outside of Catalonia with solidarity demonstrations against police violence and repression. Huesca, 08:30pmh at. Plaza Zaragoza. Teruel, 08:00pm at Plaza San Juan. Zaragoza, 07:30pm at Plaza Espana. 07:04pm General strike demo in Barcelona is marching. 07:50pm Solidarity protest at Sol square in Madrid right now. Against police violence for the right to decide. #Solidarity with the people of #Catalonia! #3Oct #VagaGeneral30 According to local cops 700.000 people took the streets in #Barcelona today. Several 100.000 in other Catalan cities. 1041pm We will end our live coverage for today now. Thanks for reading. If you like our work, at the bottom of the page you can find how you can support us. We want to stay independent and need your support. Just a note, it’s CNT without IWA. #Catalonia: Waiting For The Storm? | Enough is Enough! Tomás Ibáñez on #Catalonia: About Storms and Compasses | Enough is Enough!